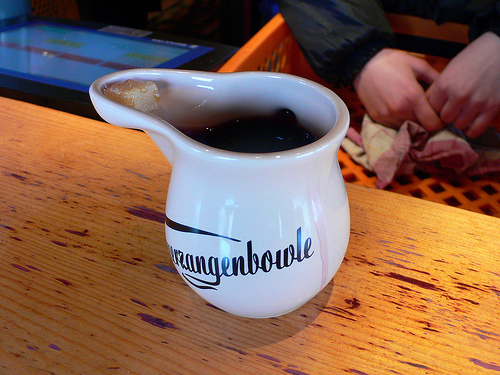 On my trip to Munich I ate and drank my way through the best that the Christmas Markets could offer, including an interesting tipple called Feuerzangenbowle. We tried our Feuerzangenbowle at the Tollwood Festival, a crafty, ethnic and organic (or Bio, as it’s called in Germany) market, held on the same Theresienwiese Fairground where you’ll find the more famous Oktoberfest beer festival in the autumn. This variation on mulled wine has an extra kick in the form of a shot of rum and amareto liqueur and was served in an earthenware mug with a spout.